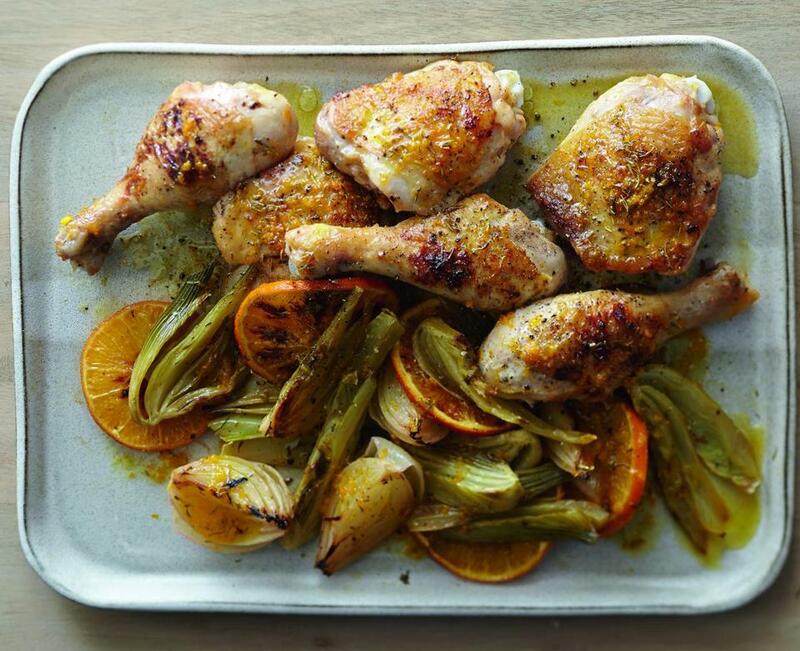 Roast chicken with fennel and orange. In some Jewish homes on Passover, the perennial gefilte fish, matzo ball soup, brisket, and potato kugel are sharing space — or nudged off the menu completely — with fresher, lighter fare, often of Mediterranean and Middle Eastern origin. And the changes are evident in the tableware, too, which is no longer draped in tradition. Grandmother’s silver may be too tedious to polish and her wine glasses too good for the dishwasher. “There are views that Jewish food is static, but it’s not,” says Leah Koenig, author of the new “Modern Jewish Cooking.” She says young people in their 20s and 30s, many of whom have visited Israel, are not only familiar with falafel and hummus, but now stock their pantries with tahini, za’atar, pomegranate molasses, harissa, and sumac. Koenig, who lives in Brooklyn, believes people are interested in “finding newness with something that feels familiar.” For example, her book includes a recipe for matbucha, a North African salad of cooked tomatoes, bell peppers, eggplant, and onion, similar to French ratatouille. 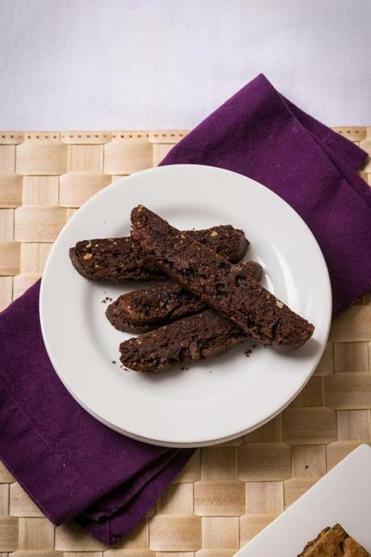 “It’s a good way to amp up the flavor of foods at Passover,” she says, suggesting its use as a spread for matzo or as a zesty sauce for fish, chicken, or vegetables. Fresh mint and sweet dates bring Middle Eastern flair to a grated carrot and arugula salad, and a recipe for chicken with oranges, a common pairing, gets a boost from sweet, licorice-tinged fennel. In “The New Passover Menu,” Maryland-based author Paula Shoyer uses plentiful spices, herbs, and ingredients from temperate climates. There’s roast chicken with salsa verde, Moroccan spiced short ribs, cauliflower with basil pesto, and tuna with olives and capers — dishes likely to be new to most Passover tables here. Shoyer’s Sephardic-style poached white fish with peppers can replace gefilte fish, and an asparagus, zucchini, and leek kugel is a lighter, greener option than potato pudding. Clifford Watkin, and his wife, Laura, who live in South Boston, attend two family Seders each year. While everyone loves the brisket and tzimmes, and has come to expect the lime green Jell-O mold at one of the meals — “It’s hard to change those traditions,” says Clifford — he likes contributing a dish with unexpected flavors. The South African native, who enjoys cooking recipes from all over the world, plans to saute Brussels sprouts with garlic and toss them with roasted tomatoes seasoned with cumin and harissa. 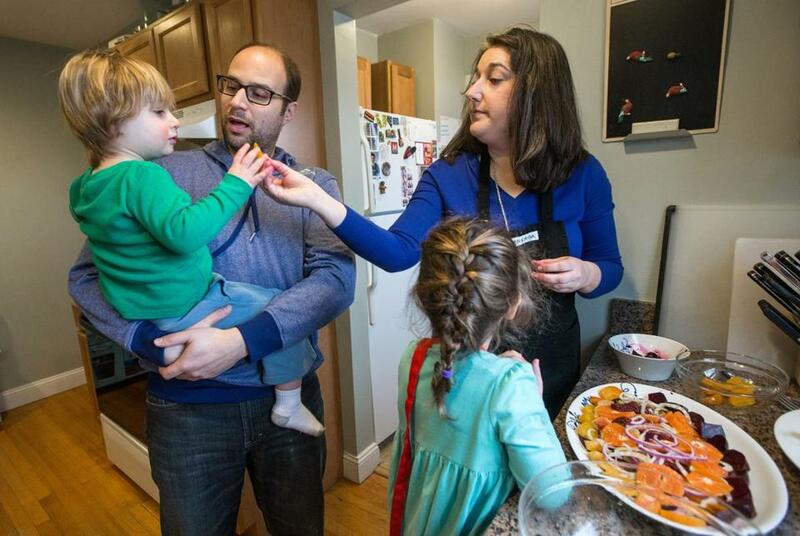 Sarah Ruderman Wilensky is hosting Passover this year for some family (including, above, husband Ryan, and kids Miles, 2, and Emmy, 4) and friends, but without her parents. “It gives us an opportunity to modernize our meal,” she says. When the next generation assumes the role of holiday cook, change can come more naturally. Jewish educator Sarah Ruderman Wilensky is gathering a few local family members and friends, not all of whom are Jewish, for a Seder. It’s the first year neither of the couple’s parents would be attending. “It gives us an opportunity to modernize our meal,” says the Newton resident, who will “cook a brisket, but it won’t be like my mom’s.” She prefers a southern-style dry-rubbed piece of meat (they don’t call it brisket in front of the couple’s young children because the family cat is named Brisket), which she intends to serve with a fennel, beet, and orange salad, asparagus with lemon zest, and perhaps a cauliflower kugel. As for the table itself, the look is more modern and hosts are fussing less. Koenig remembers helping her mother polish her grandmother’s silver, but her own holiday table will be set with mismatched china and Mason jars filled with flowers. “We’re a little less formal and a little more rustic,” she says. Shoyer agrees. “Nobody I know uses white tablecloths.” For her, that’s a kind of freedom.